It’s been six weeks since I moved in the middle of June. The only knitting I have put around my fingers is the two sweaters I started back in April. What I really mean is that my yarn is still in plastic bins. I can’t get to the stash for all the hard plastic. And these bins are either stacked in the floor of the closet under my hanging clothes or around the bed in the extra bedroom and there’s even one bin still languishing in the far back corner of the rental storage unit. Also in even more bins and boxes are fabrics and patterns and magazines related to my sewing hobby. I have already made the decision to concentrate on the knitting as it’s more mobile, more creative in some ways, and I’m more sane when I knit than when I sew. With sewing I am stuck by myself in the bedroom with the machine. With knitting I can be all over the house, yard, town, even the county! I discarded a lot of stuff during the move as I have reached the age where I know I am not “going to get to it, one day.” Especially if I keep up this knitting. Even with what I discarded, there is wwaaayyy too much left. So, let’s get real. I am not going to do anything with all that fabric. So what do I do with it all? It definitely is not going to the garbage can to be picked up by the mean green machine on Tuesdays. A good friend is active in the Homemakers club where I previously lived and I will cull out what I do not plan on using which will be about 75 percent of it. I plan on keeping about two bins for myself. She can have the rest. What is really bothering me about all this excess is that I cannot get a grip on what I do have so I can create all these wonderful and beautiful things which are in my imagination. And who wants to spend all morning searching for that particular yarn or piece of fabric? And when it is found, you are mentally tired and want to move on to something else. 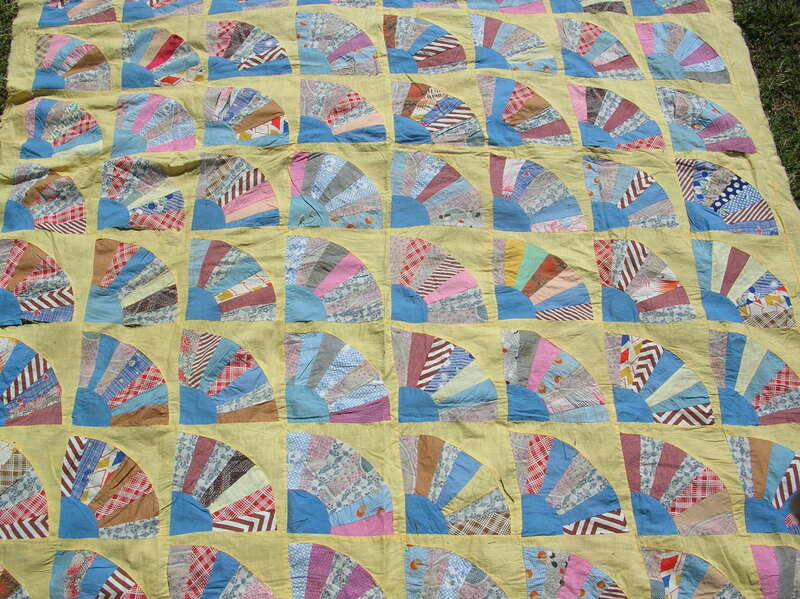 When all this material is sorted out, the first thing I will to do is to make a quilt from my mother’s house-dresses and remnants from the dresses I made my daughter when she was a baby and toddler. Plus, there is fabric from dresses I cut out and never made for her. 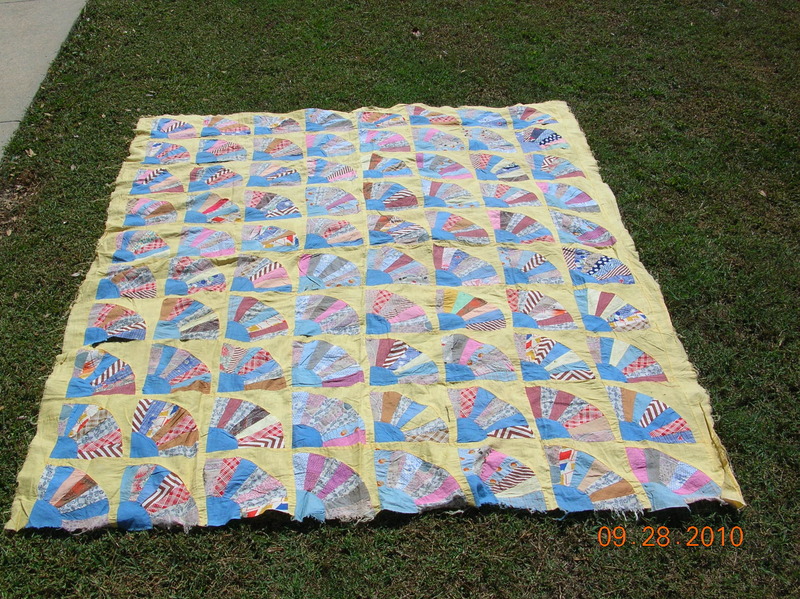 Long before I was born, Mama made a quilt top using the Grandmother’s Fan pattern and that is what I will use as my pattern. As you can see she used a yellow cotton broadcloth for the background but I think I will use a blue as that is the color I most associate with her. Also, most of her dresses were predominately blue. Perhaps I was unconsciously influenced by her when I picked the blue yarns for the two sweaters I just finished.